When the news was first reported that historic teams would not be available to play online in NBA 2K12 that was a big disappointment. Considering that rosters are largely the same as last year due to the lockout they would have provided some much needed variety and been the incentive to play online. 2K Sports didn’t really comment on the subject to explain why that was – but now it appears to be evident. 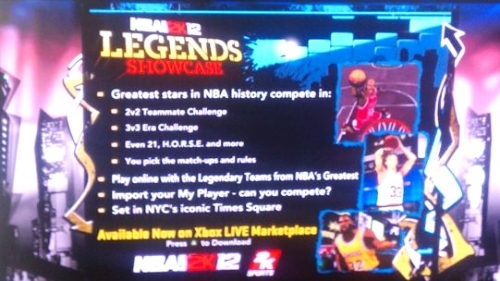 The option will be available through paid downloadable content called “The Legends Showcase”. The image above was tweeted out by someone with a copy of the game and it shows what is being included in the DLC. An outdoor environment in Times Square is the locale for what will be historic team match-ups online and special legend-based challenges. No word on how much the DLC will cost as of yet but it does look like it will be available on release day. This represents a shift away from the company’s avoidance of holding content to release as DLC – something that was inevitable. This may very well provide value as an add-on but it may not have been the year to go this route considering many consumers don’t view the base product as desirable because of the ongoing lockout.